EPCOT Center was originally imagined by Walt Disney himself. He wanted the area to be a true, working city – a community of tomorrow. When Epcot was finally built in 1982, it took a much different avenue. 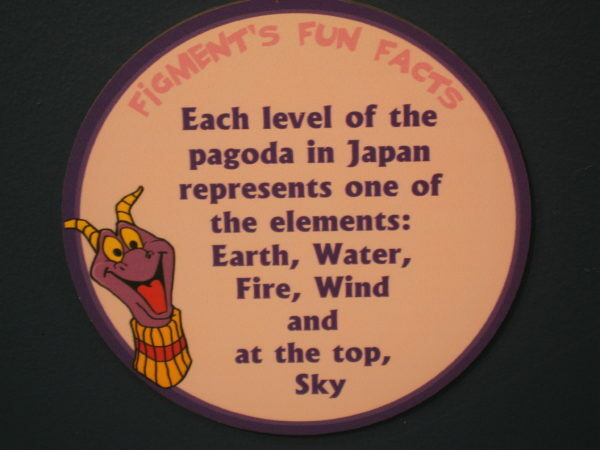 However, Epcot is still a lot of fun, and Figment likes to share information about his favorite Disney park. 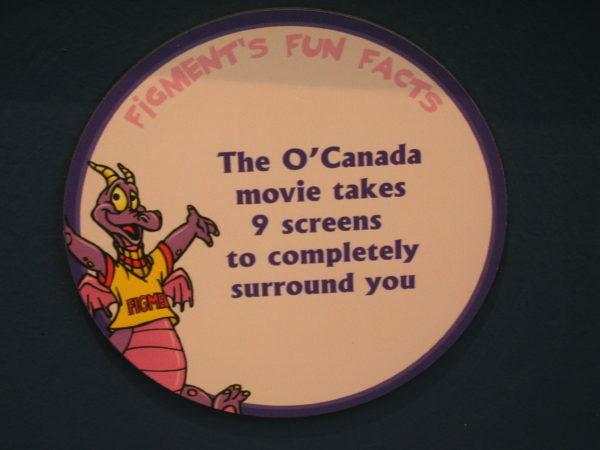 Let’s take a look at eighteen fun facts about Epcot, present by Figment, and taken from a display of historical Epcot information. 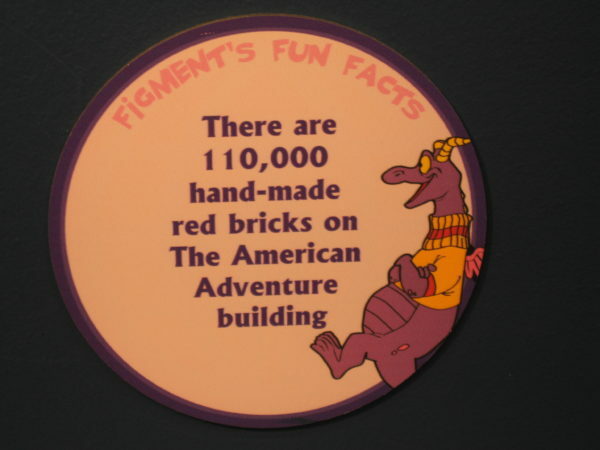 Figment has some trivia to share with you! Horizons opened on October 1, 1983. 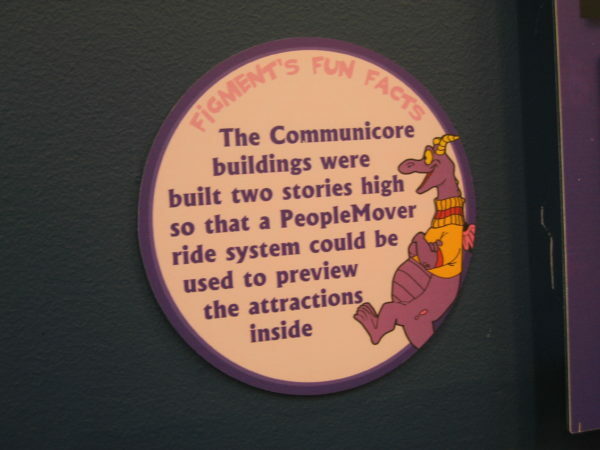 It was an Omnimover dark ride sponsored by General Electric that featured all of the Future World elements including communication, community interaction, energy, transportation, anatomy, physiology, sea, land, air, and space. 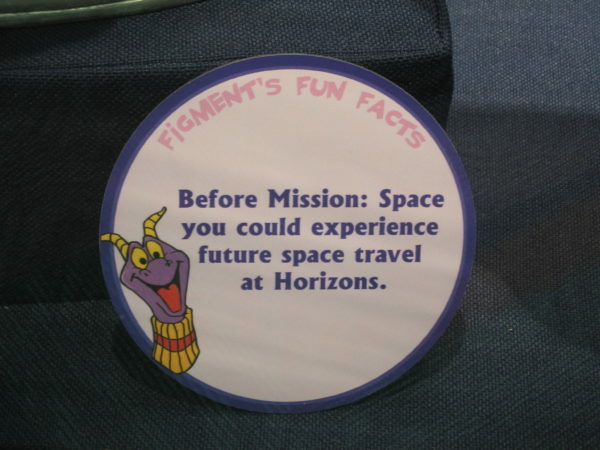 Horizons was the first and only attraction at the time that included multiple endings. Riders could choose which path to take including Brava Centauri (space colonization), Mesa Verde (arid-zone agriculture), and Sea Castle (ocean colonization). Horizons closed permanently on January 9th, 1999 and was demolished to make room for Mission: SPACE which opened more than four years later. Do you remember Communicore at Epcot? Communicore was an opening day attraction that showcased technological advancement. It was conveniently located near Universe Of Energy allowing guests to visit that attraction then head over to Communicore to learn more in a hands-on format with rotating installments mostly focused on computers, robotics, and electronics. Having a PeopleMover in this area would have created a sense of cohesion with Magic Kingdom, and it would have appropriately integrated Walt’s vision of the future of transportation. Innoventions now stands in the area. Oktoberfest is a well-known Germany tradition, but it only runs for a handful of weeks out of the year. 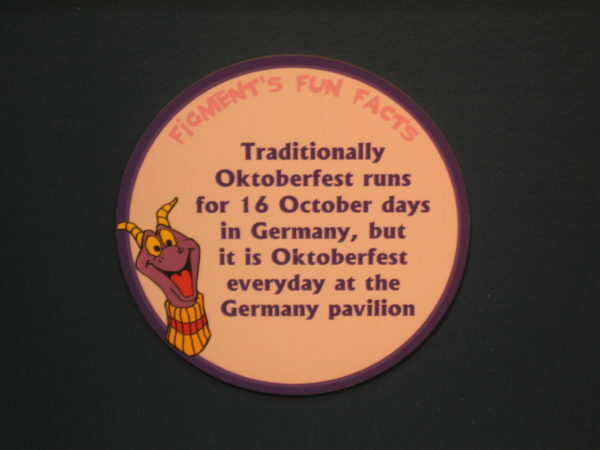 Fortunately, the Germany pavilion in Epcot’s World Showcase has Oktoberfest all year! Book your Advanced Dining Reservations at the Biergarten Restaurant to enjoy your favorite German food and music. The American Adventure building houses The American Adventure show, which is an audio-animatronics attraction featuring key moments in United States history. Voices of Liberty sing in the oval-shaped rotunda, and guests can read quotes from famous Americans including Walt Disney. There is also a Hall of Flags display of all of the US Flags in history. The handmade bricks on the face of the building are made in the style of Colonial America and represents the craftsmanship of the period. The pagoda structure in Japan has five levels representing each of the elements in this world. The pagoda is traditionally a religious structure of the Buddhist culture that represents solidarity. The larger base with sequential levels getting smaller creates a solid structure. Japan was one of the first World Showcase pavilions. Throughout the years, there have been several planned attractions including a Meet the World film and a roller coaster like Disneyland’s Matterhorn Bobsleds with a Mount Fuji theme. None of these attractions have ever come to fruition. One of the attractions in Japan is the amazing Taiko drumming performed by Matsuriza. Norway is known for their mythical and nocturnal trolls. 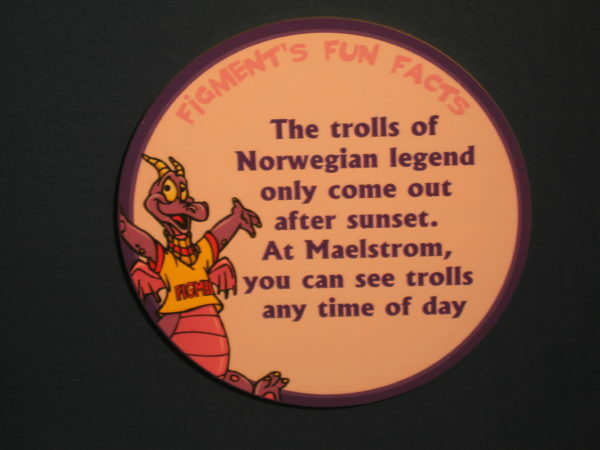 Like a perpetual Oktoberfest, Maelstrom had trolls all day everyday. Maelstrom was a log flume dark ride that opened in 1988. It depicted Norwegian culture including the Germanic god Odin, trolls, oil rigging, and a stormy North Sea. During the ride, the trolls were angered by the trespassing boat and set it flying backwards. The ride ended with the Spirit of Norway film that encouraged tourism. The attraction closed in 2014 to make way for Frozen Ever After and a Frozen meet and greet with Anna and Elsa. 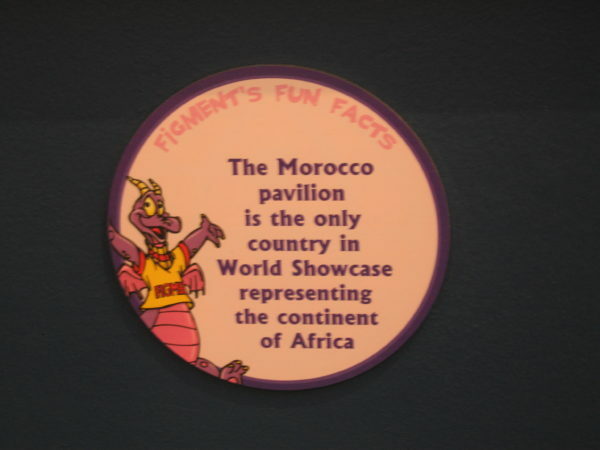 Morocco was the first pavilion to open as part of the Phase II of World Showcase. When Imagineers originally conceived the idea of World Showcase, they hoped that the countries would sponsor the pavilions in an effort to drive tourism to their country. 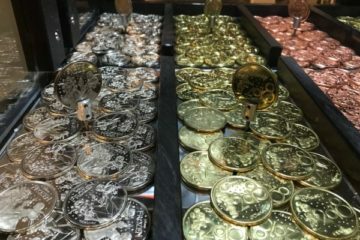 Most countries were not interested, but the government of Morocco not only sponsored the pavilion; they send artisans to design and bring to life a Moroccan city in concordance with their beliefs. O’Canada is a 14-minute Circle-vision 360° narrated by famous Canadian Martin Short. Canadian Idol winner, Eva Avila sings the theme song, “Canada (You’re a lifetime journey). The movie was produced in 1981 and updated in 2007. It has run continuously at the Canada pavilion since Epcot opened. The nine screens in the O’Canada display images of quaintly named towns like Moose Jaw and Medicine Hat. These show the rustic areas of Canada and the outdoor activities like ice-skating, skiing, curling, and hockey. You feel totally immersed in the beauty of Canada as you look around you. In the United States, red can mean danger and can be intimidating. We’re told never to wear red to an interview and be careful about wearing red to work and meetings. In China, red represents joy and good fortunate. It’s often used to represent the Chinese New Year, weddings, funerals, and other special holidays. 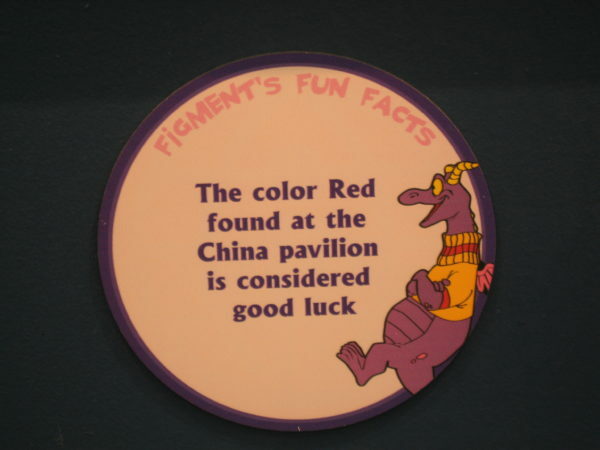 As such, the red in the China pavilion is symbolic of Chinese culture. The real Eiffel Tower is named after Gustave Eiffel, an engineer whose company built the tower. Construction started in 1887 and ended in 1889 just in time for the 1889 World’s Fair. Today, it stands 1,063 feet tall as one of the most recognizable structures in the world. It is truly iconic of France. 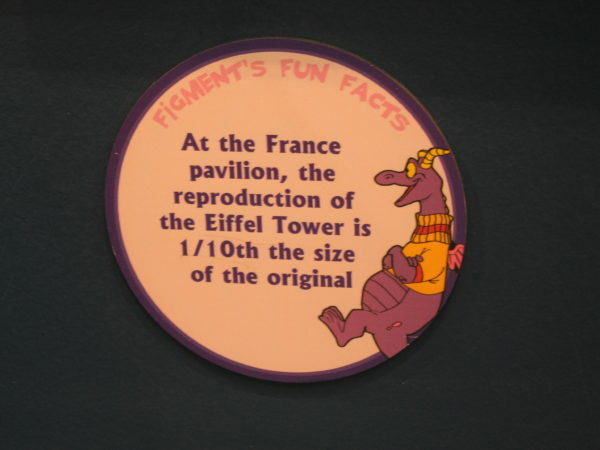 It only seemed logical to have a scaled version in the France pavilion in Epcot, so Disney Imagineers used forced perspective to make it seem taller than it actually is. The World Showcase version stands just 103 feet tall. Historically, the gondolas in Italy were a primary mode of public transportation moving citizens around the watery city of Venice. Today, the flat-bottomed row boats serve mostly as tourist attractions. 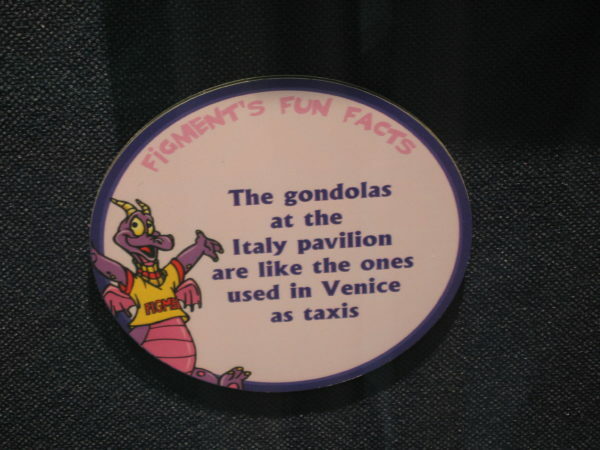 The gondolas in Disney World serve as decoration and add to the authenticity of the Italy pavilion. It’s not practical or safe to be shuttling visitors around on small row boats, so Disney uses larger ferries instead. The telephone booths in the United Kingdom are as iconic as the Eiffel Tower in Paris. The last phone booths were constructed in 1985 and many still stand in Britain, but no new ones have been added since then. The familiar boxes have appeared in many television shows and are recognizable world wide. Disney used to have real, working phone numbers for these booths, but they have since disconnected them. 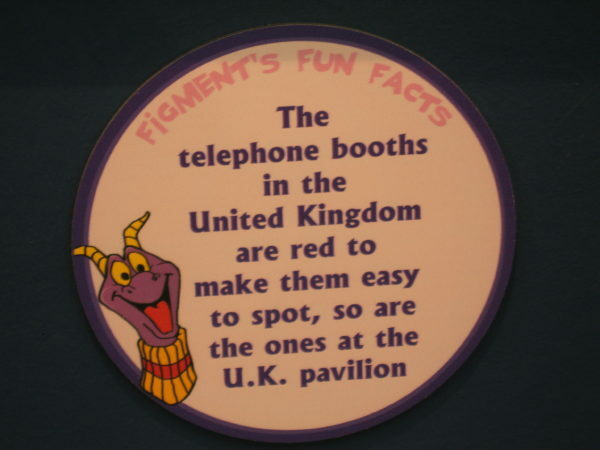 You used to be able to call the numbers from anywhere around the world and talk to someone who was in Epcot at the time given that someone heard the phone ringing. It’s not clear why Disney disconnected the numbers, but they’re still an awesome photo op! General Motors has sponsored the pavilion that used to be house World of Motion and is now Test Track. This attraction has had several “stories” throughout it’s time. First, World of Motion showed guests forms of transportation throughout the years starting with foot power and going through water transportation, the wheel, flight, steam, traffic jams, speed tunnels, and the future of transportation with a simulated car of the future. Test Track was in jeopardy as GM was laying off many of their workers; fortunately, Disney was able to save the pavilion by allowing GM to advertise their cars inside the attraction. Test Track took riders through the process of testing a car to check for safety. When Test Track reopened after a renovation in 2012, the update allowed guests to create their own Sim Car and test it on the track! 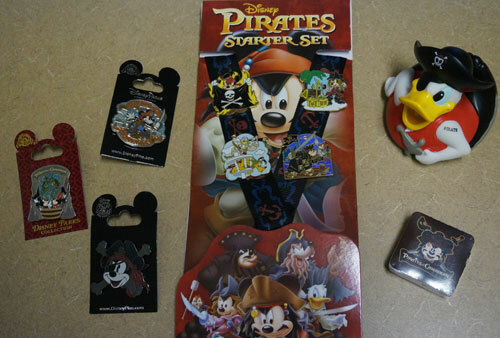 This was possible with the use of Disney’s new MagicBands. As the ride progressed through the safety checking process, guests could see how their design fared. 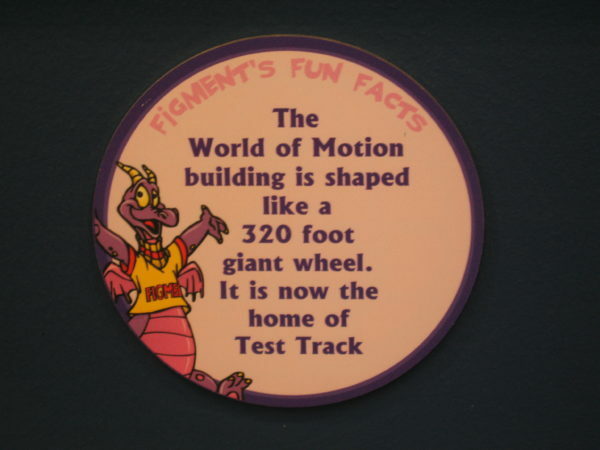 The wheel design can be seen during the outside portion of the ride during the speed test. Riders fly through the crash wall and reach speeds over 60 miles per hour. After the attraction, guests are let off into the post show where you can further play with your Sim Car and see new Chevrolet cars. There are even sales people on hand to talk to you about features and options. The Universe of Energy pavilion has also housed two attractions since it opened as a structure of groundbreaking technology in 1982. In the last version, Ellen’s Energy Adventure starred Ellen DeGeneres, Bill Nye The Science Guy, Alex Trebek, Johnny Gilbert, and Jamie Lee Curtis. This attraction discussed the history of energy sources including fossil fuels, solar, and hydroelectric power. It started with a scene of Ellen challenging her rival, played by Curtis, to a Jeopardy! game. Ellen has some trouble with a science category, so Bill Nye and Albert Einstein jump in to help. Film one presented the theory of the Big Bang and the formation of fossil fuels. Then, guests were taken through a Primeval Diorama with audio-animatronic dinosaurs. These sections showed riders the effects of almost 300 million years in just a few minutes. Soon the Universe of Energy will make way for Guardians of the Galaxy. 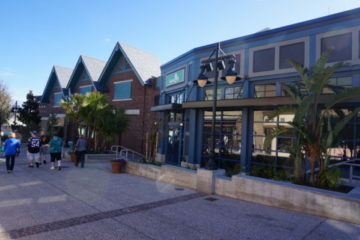 The Coral Reef is a restaurant inside The Seas pavilion. Diners are seated in front of a giant 5.7 million gallon aquarium. It’s one of the largest man-made ocean environments in the world surpassed only by the Georgia Aquarium, which opened in 2005. 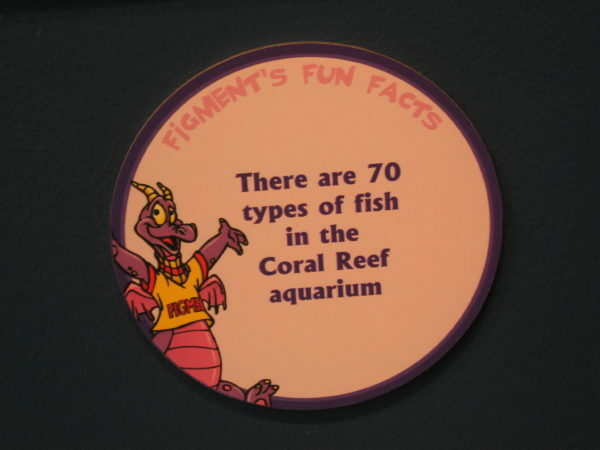 There are over 4,000 sea creatures and over 60 species including sea turtles, angelfish, dolphins, sting rays, sharks, and more. Fish feedings occur daily at 10AM and 3:30PM. 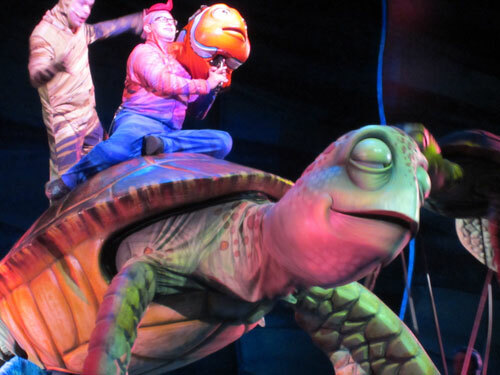 During this time, a trained Cast Member will describe the animals right in front of you. In my experience, there are knowledgeable Cast Members there all day. 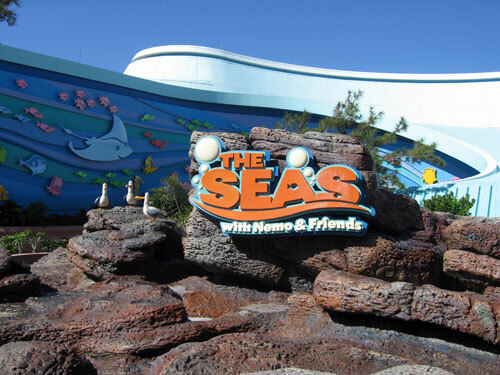 To compliment The Seas, there is The Land pavilion. It was present on opening day and shows guests about how their actions effect the land itself showing humans can positively and negatively impact the world in which we live. Currently, The Land houses three attractions and one behind the scenes tour. Soarin‘ Around the World is on the lower level and Living with the Land is adjacent while Circle of Life: An Environmental Fable (hosted by Simba, Timon, and Pumbaa from The Lion King) is on the upper level. Behind the Seeds is a one-hour tour showing guests what they’re researching and how it’s being done. While this is discussed in Living with the Land boat ride, it is more in depth and personalized during the tour. In addition to these attractions, The Land is also home to one of the top rated dining establishments in Epcot – Sunshine Seasons. This quick-service restaurant serves a variety of options including gluten free, vegan, and vegetarian meals. What’s more, much of what is served is harvested in this pavilion. With so much inside, it’s obvious that this is a huge area. 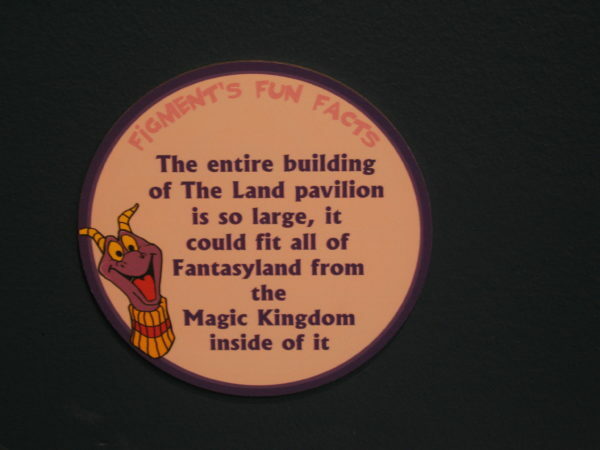 It’s so big in fact that all of Fantasyland in Magic Kingdom could fit inside this 2.5 million square foot building. 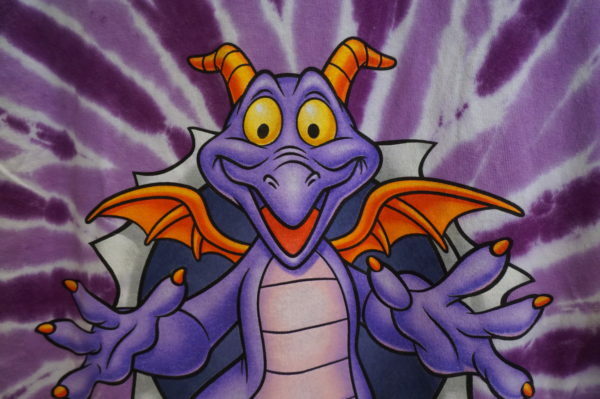 Figment was the original purple dinosaur. He arrived in Epcot as the mascot of the Imagination! 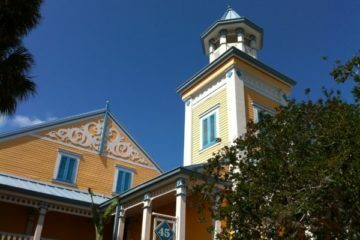 Pavilion and the Journey Into Imagination attraction. He is made of “two tiny wings, eyes big and yellow, horn of a steer, but a loveable fellow. From head to tail, he’s royal purple pigment, and there, Viola, you’ve got a Figment!” This song that explains him is called One Little Spark and was written by the famous Sherman Brothers. 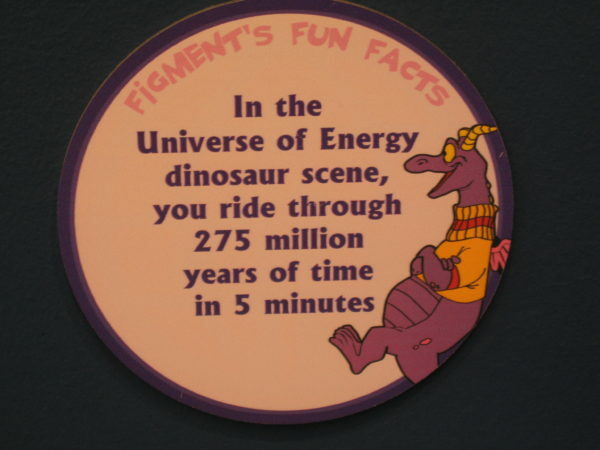 When Figment was briefly removed from Journey Into Imagination, fans were outraged. Disney returned him later. 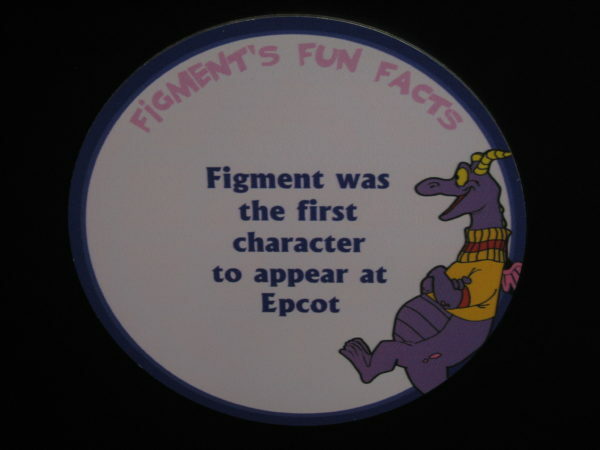 Figment was the first character to ever appear in Epcot, and he has become the mascot of the attraction. The iconic geosphere in Epcot is the park’s icon. It is one of the first things you see upon entering the park, and it is recognizable worldwide. Inside this 18-story structure is a time-machine themed Omnimover attraction takes riders through the history of communication in 15 minutes. From the prehistoric cave drawings to the alphabet, the printing press, and today’s telecommunication and mass communication outlets, Spaceship Earth is appropriate for all ages. In the end, you can design your own future using the touchscreens in your car. It’s one of the only attractions in Disney World with alternate endings. Spaceship Earth is a sphere standing on a tripod of legs. Geometrically, it is a Class 2 geodesic polyhedron meaning that each piece is divisible by eight. Each piece is formed by three isosceles triangles reaching to a point. Without the supporting legs, there would be 11,520 triangles and 3,840 points. However, there are actually only 11,324 triangles and only 954 of them are partial or full flat triangles. These triangles are made of Alucobond, which is a metal similar to what Apple constructs MacBooks out of. They are rust proof and have enough space in between each one to allow for an integrated drainage system. Therefore, if you stand under Spaceship Earth while it’s raining, you don’t get wet from the water run-off. To make this structure possible, it was constructed in two dome-shaped pieces split horizontally. The supporting pylons were driven 160 feet into the ground. 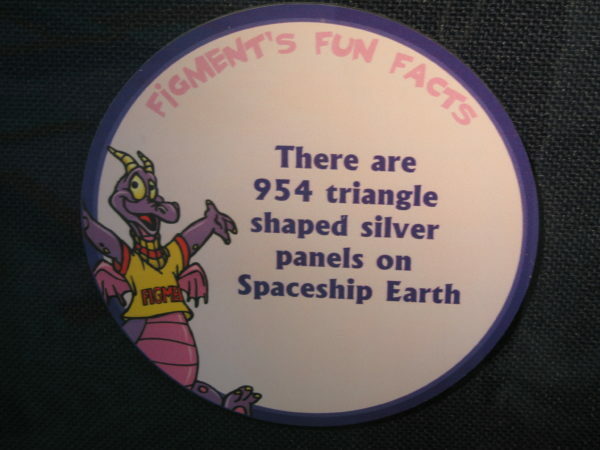 Epcot trivia: Do you know how many triangles are in Spaceship Earth?